When pumpkin seeds are domestically grown, aggressive growers usually start planting seeds indoors between April 24 and May 5. However, pumpkins may begin growing in late May on their own an develop into giants. After about a week, back-up seeds are planted by gardeners to ensure a pumpkin, or at least a few extras. Nine to ten days after planting, seeds will sprout from the soil, being exposed to the world for the first time. The first true leaves won't appear for another ten days or so, and gardeners won't transplant for another five days after that. When they are transplanted, they are generally covered in the evenings to keep the young plants from being harmed by frost. Around June 15, or day 51, the insects begin to become a factor in the growing process. As earlier stated, they do bring some problems, but are also the pollination helpers the plants need for sexual reproduction. The flowers develop in July, around day 70. The plants are then ready to be pollinated, and around three days later, they have hopefully been successfully pollinated. 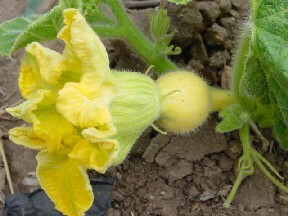 After pollination, gardeners usually switch to a higher-quality fertilizer for the plant to support the developing fruit. Just like people and animals, pumpkins undergo sexual reproduction. 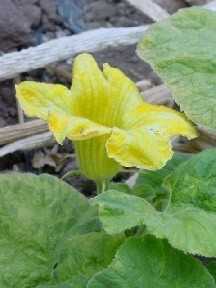 The pumpkin plant has separate male (Figure 1) and female (Figure 2) parts on the same plant, making it monoecious. The female flowers contain ovules, and male flowers contain pollen. When an insect flies from one flower to another to collect nectar, the pollen from the male plant's anthers sticks to the insect's body. It is then carried to the female flower where it fertilizes the egg. When the gametes (pollen and egg) unite, the DNA in each combine and form a diploid seed (zygote). The seeds have hard coats to protect the developing embryo and contain the nutrients it needs to grow. 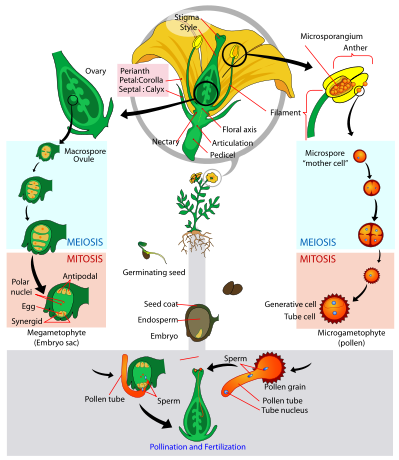 The following diagram is a model of the angiosperm life cycle, including the separate development of the male (microspore) and female (macrospore) parts of the plant. Throuhout July and August, the fruit develops and grows. This is a critical and cautious time. Insects, fungus, and other hungry animals present a threat at all times. This is also the time that the plants need the most water and nutrients. Without, the fruit won't grow as large and healthy. After about 100 days, the skin will take on the harder form of a rind with ribs and develop an orange color. If properly grown, around this time, the pumpkins can reach sizes of up to 100 to 150 pounds! Toward the end of August, the hours of natural sunlight and temperatures decrease, as does the rate of growth in the fruit. Although the growth has slowed, they are still given until the first week in October to continue growing. After about 160 days of hard work, gardeners harvest their pumpkins to eat or take to county fairs. Now that you've seen what the pumpkin goes through to reproduce, I bet you're wondering how it interacts with other organisms. Click here.